Roman Centurions 753-31 BC is a solid addition to Osprey's Men-At-Arms series. Ancient history researcher and professor Raffaele D'Amato discusses the Roman centurion within the organization of the military, his social status, promotion, duties, arms, and equipment. The reader can be confident in D'Amato's knowledge of historic sources for clothing, armor, and weaponry of the centurion. He previously coauthored Arms and Armour of the Imperial Roman Soldier (2009) with Graham Sumner, an expert in the subject. Roman Centurions features many styles of armor, shields, and helmets & crests that one does not typically see in other illustrated books. I was most intrigued by the Caesarian-era leather armor based on period sculpture from Aquelia and Narbonne. The bronze shield seen on the cover is intriguing, but might need more evidence. There is sculptural evidence showing circular shields were sometimes carried in the late Republican period, yet the D'Amato does not provide support for the bronze material. For these armor and equipment reconstructions there is a strong reliance on ancient representational art (sculpture and frescoes). It is always best to compare art to actual archaeological finds, and D'Amato does this where possible. When there is no surviving example to compare (as with perishable leather or quilted armor), then a best guess is made using similar known objects as general guidance. Some of his interpretations might be debated, but there isn't anything especially controversial. There are often new discoveries being made, so the coming years may confirm these illustrated reconstructions. The artwork by Giuseppe Rava is just fantastic. I'm a big fan of his work. There are five fully illustrated plates (with backgrounds) and three plates of just the men (white backgrounds). Rava first caught my attention ten years ago with his box art for the 1/72 toy soldiers by Hat and Italeri. I'm very glad to see his art in Osprey's books. Compare D'Amato's and Rava's Etruscan centurion reconstruction with that from Ancient Warfare magazine vol iv, issue 1. Also check out the magazines issue devoted to Caesar's campaigns, vol ii, issue 4. Love it, you can't beat Osprey! The centurions certainly were a colourfull lot. The one thing...where do they get all the source material for the exact make up of kit and colours???? 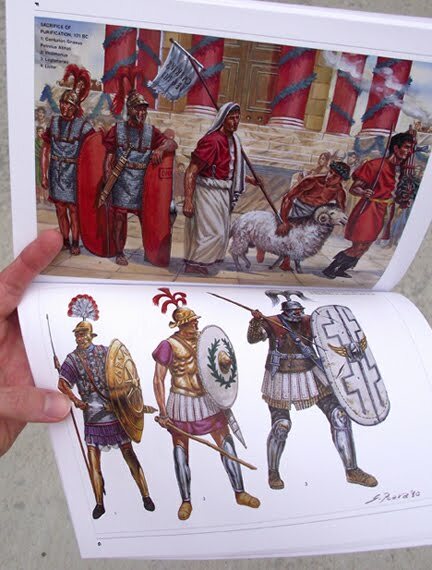 Hi Paul, I know Graham Sumner wrote about clothing colors in his series of Osprey Books: Roman Military Clothing. In this book by D'Amato there aren't too many references to explain the color choices. P.S. I just read a hunting fresco in Stabiae provided the color palette for one of the figure's clothing colors.